When I flip through a new cookbook, I usually look for recipes that call for only a handful of fresh ingredients and have a brief preparation. I don’t have the time or patience for anything complicated. 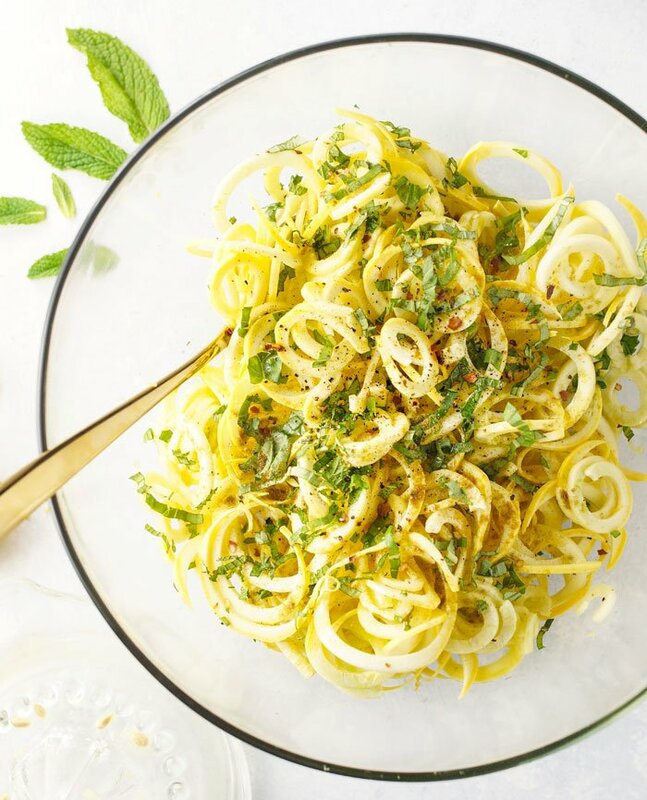 That’s why I love these Spiralized Summer Squash Noodles with fresh basil and mint. This recipe comes from my friend Amie Valpone’s book, Eating Clean, which was released earlier this year. 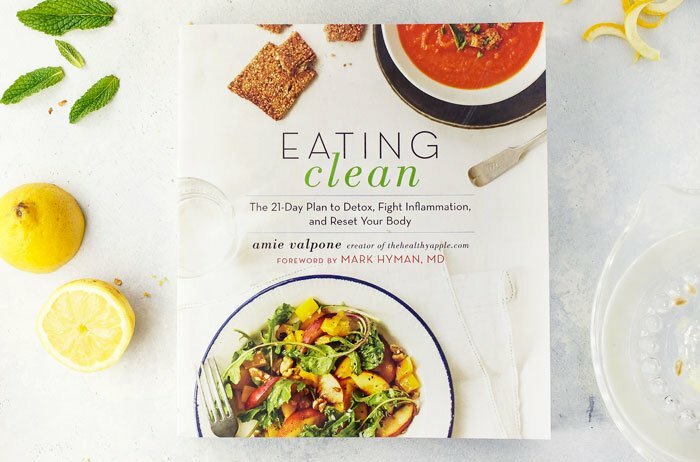 If you’re not familiar with Amie’s blog, The Healthy Apple, Amie shares recipes that meet her detox anti-inflammatory criteria– no gluten, dairy, soy, refined sugar, eggs, corn, peanuts, white flour, or caffeine. 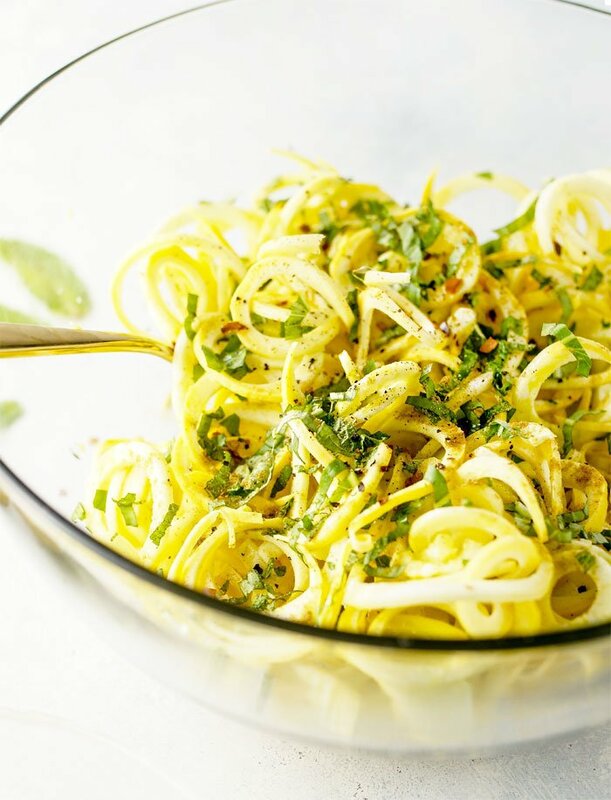 These Grain-Free Basil & Mint Summer Squash Noodles are a great example of how fresh and simple Amie’s recipes can be, letting the ingredients really shine. 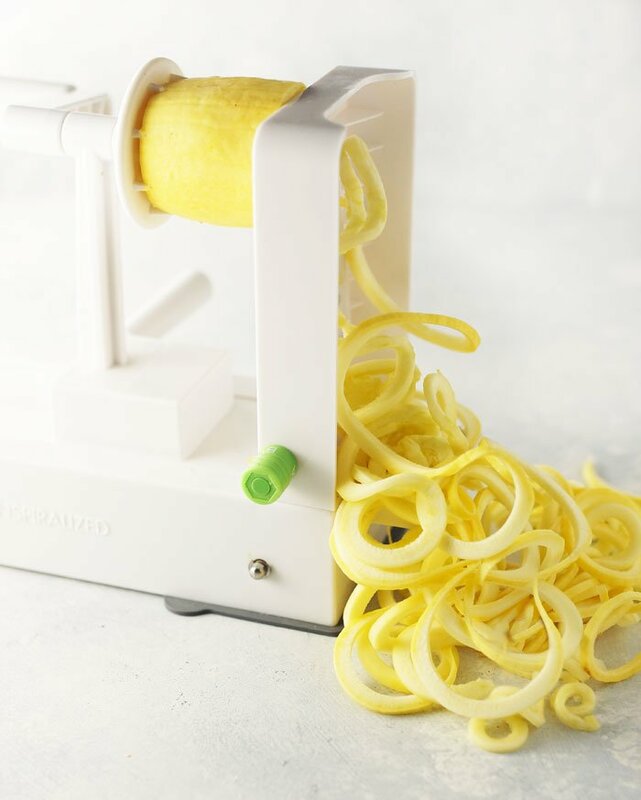 It features spiralized yellow squash “noodles” (that I made using the Inspiralizer), which are loaded with vitamins A and C, along with magnesium, folate, and potassium. Summer squash is particularly high in beta carotene and lutein, which are thought to promote eye health, and its also loaded with antioxidants to help protect you body from free radical damage. 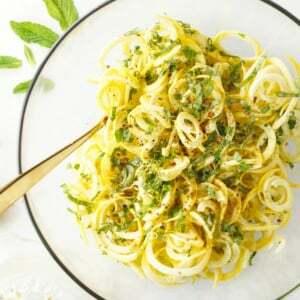 Paired with fresh lemon, another great source of vitamin C, fresh basil, which has anti-inflammatory and antiviral properties, and fresh mint, which can calm digestive issues, this quick noodle dish is loaded with nutrition and might need to be added to my regular lunch rotation. She’s given me permission to share the recipe with you today, which I love because it takes only 10 minutes to throw together. No cooking required! I hope you’ll enjoy it as a fun alternative to leafy green salads while meeting your #EatYourDaily10 goals. Note: Because the seasoning on these noodles is so light and refreshing, I’ve found that you can use any remaining leftovers in another dish, too. Waste not, want not! I’ve tossed these “noodles” with pesto sauce in a skillet, and have also used them as a salad topper the next day. As always, if you make any modifications or substitutions, please let us know how it worked for you in the comments below! Reader Feedback: What’s your favorite way to dress up spiralized noodles? This looks great. I have yet to buy a spiralizer but plan to soon. Any thoughts on brand or how much to spend? Hi Jeanne, I highly recommend The Inspiralizer. It’s the one Megan linked and pictured in her blog. I originally bought the Paderno because it is highly rated on Amazon, but it doesn’t stick to my countertops, and “walks” when I try to spiralize anything. The Paderno is in my donate pile. The Inspiralizer is a dream to use, it locks in place, easy to switch blades, and there is less produce waste. It’s worth the extra money.